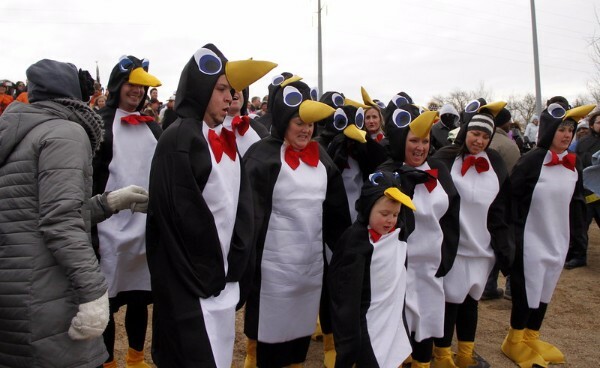 Special Olympics Nebraska : Events : Polar Plunge : Form a Team! It takes only one person to inspire others to get involved. Experience the Plunge with your coworkers, family and friends and Plunge as a team. 1. A team consists of more than one person. You’ll probably find that your recruits are able to recruit even more plungers for your team. 2. Get the whole team involved with selecting your team theme and costumes. We do award prizes for best team theme, plus teams seem to have more fun when they are all in costume together. 3. As team captain, register online at http://www.firstgiving.com/sone. When you open the register link, select register for an event and follow the instructions. Firstgiving will ask you if you are part of a team, click yes and enter your team name. Step-by-step instructions are available here. 4. Distribute plunger information to team members. Each plunger must register as an individual, but they should link themselves to your team. You may also want to give each person a copy of the registration form to help manage so they have all the details of the plunge. Make sure that each plunger knows your team name (remember, each person must raise $50 to Plunge). 5. At the Plunge: determine if you will handle everything for your team, including the responsibility of checking in the entire group, or have each person do it themselves. 6. After you plunge join all the other teams and plungers at the post-plunge party. You can pick up your incentives, possible win prizes, eat and enjoy the afternoon with your team.